It's the definitive account of the band's earliest years, it's not on sale but it's just arrived in our store - for anyone taking out an annual subscription. It's called North Side Story and this large-format 272-page book, full of rare and unpublished photos, reviews and interviews also includes 'North And South of the River, Wandering In U2's Dublin', a beautiful map from the band's design team. Get one along with 12 months access all areas on U2.com when you take out an annual subscription to U2.com. Buy one for a friend - a unique gift they won't be able to buy instore or online. And don’t forget to browse through our limited edition lithographs...also pretty special! 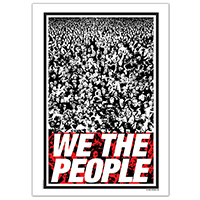 We The People Limited Edition Screenprint Limited to 150 copies, individually hand numbered. This screen print is a high-end giclée on 260gsm paper. Finished size A2 (420 x 594 mm). 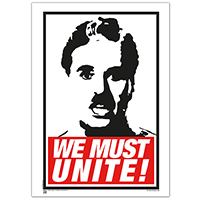 We Must Unite Limited Edition Screenprint Limited to 150 copies, individually hand numbered.